With over 40 years’ experience and a year-round presence, HTS is the Austrian market-leader, specialising in all-inclusive ski holiday packages within Austria and its surrounding countries. They offer high-quality accommodation, excellent equipment and superb ski schools. 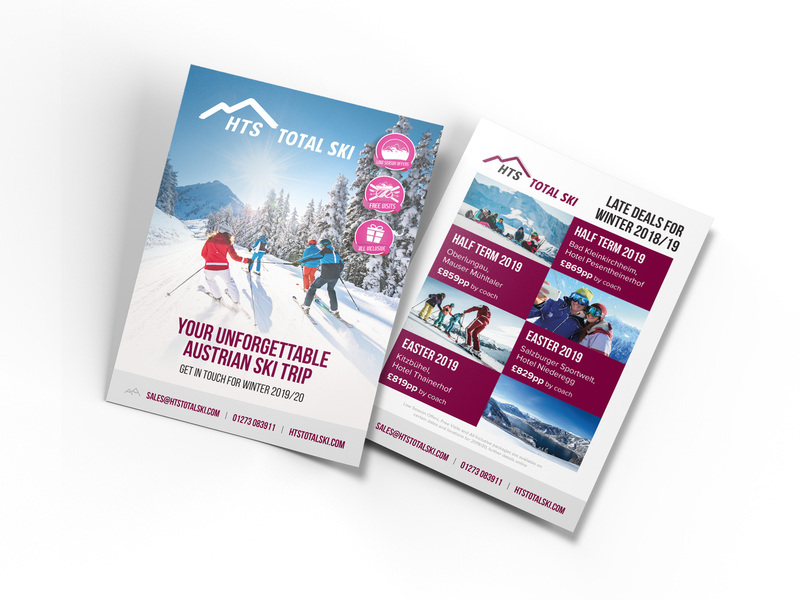 To promote their 2019 late deals to the UK school skiing market, HTS required a promotional flyer, highlighting their current special offers for half term and Easter. Looking for something clear yet compelling, Recognition was asked to design an A4 flyer to mail out to potential customers. In order to maximise the impact of the piece, we made the skiers and the beautiful mountain scenery the focal point, ensuring key information was placed around the margins. Clear and prominent calls to actions were a key part of the design. Recognition Design & Marketing Limited. The Design Studio, Buckland Manor Farm, Sway Road, Lymington, Hampshire SO41 8NN. Copyright © 2019. Registered at the above address as company number 06662941. VAT number 980 6057 07.